In recent years, DTP technology, sometimes referred to as digital platemaking, has become the standard for top quality photopolymer platemaking in the label printing industry. As the name implies, DTP eliminates the costly and time consuming photographic film processing steps by transferring the digital art files to an electronic laser imager which directly etches or ablates a microthin carbon mask on the surface of the .067” thick raw plate material (photomonomer) in what is to become the image or ink carrying area. Exposure to intense UV light through the imaged carbon mask polymerizes or cures the image area. The non image area is then removed down to a pre-established floor by a thermal process creating a relief or thickness difference of .022” between the ink carrying surface and the non imaging floor. Traditional film processing typically involved three generations of photographic film per plate, each generation introducing slight deterioration of accuracy and film quality. The raw plate material was polymerized by exposure to UV light through the final film and the non-image area was washed away with a solvent, typically perchloroethylene or an alternative solvent. 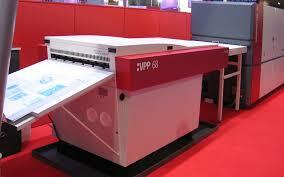 The benefits of DTP Technology are significant. Bypassing the photographic film processes eliminates the cost of film and developing chemicals as well as the environmental impact of disposing of the chemicals. Imaging the electronic art files directly onto the plate much more accurately reproduces the image resulting in better print quality, better color to color registration, and a much more accurate and faithful reproduction of the color proof. Solvent plate processing required disposition of the spent solvent as a hazardous waste. The total processing time to go from the digital art file to the press ready plates is reduced from approximately 3 hours for a conventional film processed plate to less than 1 hour for DTP. It is the opinion of the writer of this article that DTP processing represents an advancement to the quality of flexographic printing for the label industry equal to that of the advent of the photopolymer plate itself in the early 1970’s. Please feel free to contact our staff with any questions regarding the platemaking process or for a free quote! * This article was written by Dennis C. Hulton, Vice President/General Manager, Valley Forge Tape & Label Co., Inc.